Meaningful Engagement vs. Buy-In: What's the Difference and Why Should I Care? What's the Driving Force Behind Engagement? Meaningful engagement and the co-creation of change can produce much more commitment than simple buy-in can. Accelerate the pace of change. As I wrote in Meaningful Engagement vs. Buy-In: What's the Difference and Why Should I Care?, leader commitment – including the belief that ordinary people can make extraordinary contributions and the willingness to commit time, effort, and resources to enable them to do so – is the pivotal difference between enabling meaningful engagement and settling for buy-in. Without a leader’s resolute commitment to authentic involvement, the full measure of meaningful engagement will not be realized. If we know that meaningful engagement is what we want and need in our organizations, how do we go about creating it? What Might Engagement Opportunities Look Like? Before we come to the 4-step process for creating meaningful engagement in your organization, a little context for what engagement opportunities might look like is helpful. Meaningful engagement, like change in general, does not happen by accident. Helping people make consequential contributions to the process and outcome of change requires clear intent. By the definition above, any authentic involvement that allows people to make consequential contributions constitutes meaningful engagement. This opens a wide range of opportunities for creating engagement. Because the range of opportunities is broad, I find it helpful to group them into three categories. These categories align with the breadth of a change effort and the examples lend themselves to widespread engagement. Example #1: Using temporary teams to collect data and analyze the current state relative to the desired future state. Collecting “voice of the customer” data. Assessing current state organizational arrangements (structure, processes, technology, etc.). Benchmarking aspirational organizations or processes. Estimating the current cost of quality. Assessing current vs. required future levels of skill, knowledge, and ability, etc. Because this engagement is happening early in the change process, you may even enlist the help of a temporary team to assess organizational change readiness, impact, risk, and resistance. An example of this engagement opportunity is an organization that was making major changes to its production system. A mixed team was formed and trained to conduct site visits with non-competing organizations to learn about work system innovations they had designed and implemented. The team planned and conducted four site visits and made a presentation of their findings to the whole organization. What they learned was integrated into their production system redesign and had a dramatic, positive affect on the eventual outcome of the change. Example #2: Using temporary teams to address identified gaps and develop viable alternatives of material importance to the change. Employing teams to do organization design (such as creating a new unit to serve a new or expanded function, integrating units to focus effort or eliminate costly redundancy, etc.). Process analysis and redesign (to match organizational or other requirements). Evaluating and recommending technology or software application solutions. Developing and recommending new procedures. Creating and proposing development efforts to close skill gaps, and so on. 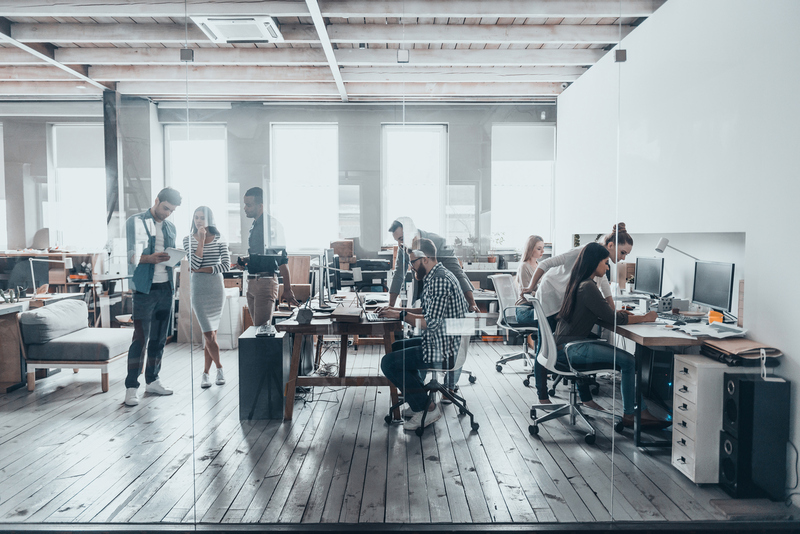 In an example of this engagement opportunity, a client organization that was focused on accelerating product development suffered from a hiring process that took too long to fill open requisitions and acquire key talent. A cross-functional team from HR and business units was formed and chartered to work on the matter. The team mapped the as-is process from beginning to end adding information about volume and transaction time to each step. Once they understood their own process and key metrics, the team benchmarked the hiring processes of three non-competing organizations. In the end, they identified nearly a dozen improvements and simplifications. The team weighed these alternatives, selected the ones they believed would make the greatest difference in the shortest amount of time, and redesigned the process to incorporate these. Once implemented, the time from requisition to hire decreased by more than 40% over the following six months. Example #3: Using temporary teams to implement chosen solutions. Engagement here could include a full range activity to plan, execute, stabilize, and sustain the change solution you’ve chosen. A technology manufacturing company that had implemented a high performance work system continued to be plagued by a PR problem. The process they used to clean parts for assembly resulted in harmful pollution and earned the company a prominent place on a list of biggest corporate polluters. One of the engineers identified a soap and water process from an entirely different manufacturing operation that seemed to have high potential to solve the problem. She led a team that included other engineers and production operators to examine the feasibility of the solution. Once satisfied that the process would do a more effective job of cleaning parts and result in only soapy, dirty water as a by-product, they made and won support for their proposal. Over the next several months, the team carefully planned the equipment acquisition, installation, and the changeover from the old system to the new in one week with minimal disruption. As a result of their meticulous effort, the new system was installed as planned in less than one week and cleaned critical parts 100 to 1000 times cleaner than the old system and emitted no noxious pollutants. The Engagement Cycle is the framework I use to describe the tactical steps of enabling meaningful engagement. Let’s talk about how to proceed through each of these steps. Enlist the direct participation of the right mix of people in some issue or action step that will make a consequential contribution to the change. Consider the phase of the change effort you’re in and choose some element of the project plan for a temporary team to work on. Keep in mind that there will likely be multiple teams working concurrently on different elements of the project plan, with each team each making a planned contribution to the whole. Select teams that represent the right mix of function, hierarchical level, experience, and expertise. Charter the teams (purpose, scope, authority, responsibility, time commitment, end date, expected deliverable, etc.) and conduct team launch events to give each team a solid start. In this step, give your teams the time, resources, and support required to do their work according to their charter. Develop recommendations and plans to implement. What each team creates and delivers will be a function of what that team is charged to do. Early in the change, for example, a team’s work may be an input to the business case for change or an assessment of some sort. Such a deliverable wouldn’t require implementation. Later, when executing change, a team’s work may deliver a critical component of the change, e.g. a technology or application recommendation, the creation of a new organizational unit, a redesigned process, or a new procedure. If the team has been chartered to develop and deliver a component that is integral to the change, then in this step the team presents its recommendation(s) and implementation plan (if required by its charter) to leadership or the appropriate oversight body. Once approved, the recommendation(s) and implementation plan are socialized with those affected and feedback is solicited. Implementing the recommendation(s) is the main event in this step. The team may broaden engagement at this point and enlist additional support to put the recommendation in place and begin monitoring its efficacy. In this step, everyone who was involved in developing and implementing this component of the change operates it as planned and implemented for a specified time. The people involved in implementing the change monitor the solution and collect relevant data about its performance. Based on experience and performance data, they develop refinements and improvements, as needed. 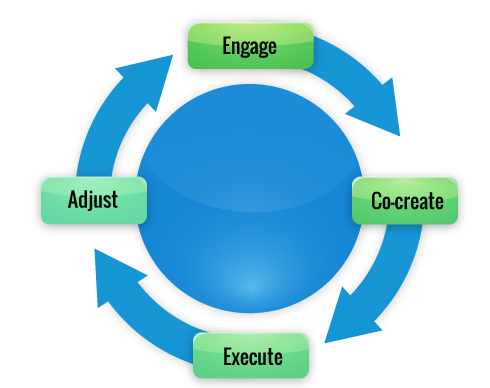 If necessary (and perhaps on a reduced scale), they may repeat the cycle of engage, co-create, execute, and adjust. The Engagement Cycle can be used repeatedly across the phases of the change effort to engage multiple teams in making consequential contributions. This process can also be used to refine and improve a particular element of the change. The Engagement Cycle is similar to the way organizations use temporary teams to address particular problems or take on initiatives. The chief difference is in joining multiple teams’ efforts to the change plan and permitting them to co-create the change every step of the way. There is nothing fancy involved here – no magic formula or secret sauce. It is the following potent combination. If you’d like to learn more about how you can take your change work to another level, please visit thechangekit.com.